Hannah has officially joined the Division II swim team at Southern Connecticut State University. 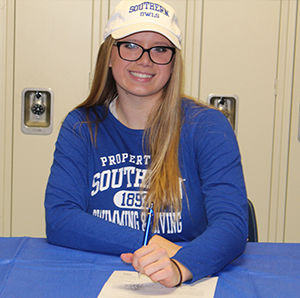 That very passion is what led senior Hannah Nyquist to sign with Southern Connecticut State University on November 29th. Hannah is officially set to join the school’s Division II Women’s Swim Team in the fall of 2019. Being a part of the athletic community at Hill has bolstered Hannah’s confidence and shaped her into the young woman she is today. “Being a swimmer has taught me to be confident in myself and have faith that I can feel that pain but also come out with success in the end,” she explained. Hannah also attributes the strong bonds and relationships formed within the swim team as a source of support and motivation. Although she is sad to leave her second family behind next fall, she is eager to see what the future has in store with SCSU. “Having a group of caring and supporting people in your life and on your team will help you push yourself to succeed to higher levels even when sometimes you think you can’t,” she said.